ANN ARBOR — A new research tool to safeguard drinking water is now keeping a watchful eye on Lake Erie. This week, a robotic lake-bottom laboratory began tracking the levels of dangerous toxins produced by cyanobacteria that bloom each summer in the lake’s western basin. The goal is to provide advance warning to municipal drinking water managers and thereby prevent a recurrence of the water crisis that left more than 400,000 Toledo-area residents without safe drinking water for about two days in early August 2014 due to high levels of microcystin toxins. The purchase of the $375,000 device, which is known as an environmental sample processor or ESP, was a direct response to the Toledo event. It is positioned at a spot on the lake bottom where it can provide about one day’s notice if highly toxic water appears to be headed toward the city’s water intake. Tests will be done every other day initially, then increased to once a day starting Aug. 1 to coincide with the expected peak in bloom toxicity. Test results are automatically emailed to the inboxes of researchers back in Ann Arbor. The project is a collaboration between CIGLR, the National Oceanic and Atmospheric Administration’s Great Lakes Environmental Research Laboratory (GLERL) in Ann Arbor, NOAA’s National Centers for Coastal Ocean Science and the Monterey Bay Aquarium Research Institute. The robotic lab, which goes by the name ESPniagara, was purchased with funds from the federal Great Lakes Restoration Initiative, which also helps pay the operating costs. Two more ESPs will be deployed for testing in western Lake Erie next summer and should be in regular service in 2019, said Timothy Davis, a molecular ecologist at NOAA’s Ann Arbor lab and leader of the GLERL-CIGLR harmful algal bloom monitoring team. Ultimately, toxicity data from the three autonomous labs will be incorporated into short-term algal bloom forecasts for the western Lake Erie basin. More than a dozen ESPs are in use globally, but ESPniagara is the first in the Great Lakes and the first to test for microcystins, a class of toxins produced by certain freshwater cyanobacteria. Cyanobacteria are photosynthetic organisms sometimes called blue-green algae. The Great Lakes are home to dozens of common cyanobacterial species, but only a few are toxic troublemakers. The Toledo water crisis was blamed on toxins produced by the common species Microcystis aeruginosa. The ESPniagara “lab in a can” was field-tested in western Lake Erie last fall. It was deployed for regular service on July 11 and began routine toxin tests on July 18. It is located about 4 miles west of the Toledo municipal water intake at a depth of 18 feet. It will remain there until mid-August, when it will be retrieved for routine maintenance, then returned to the lake in September and October. CIGLR research technician Emily Davenport spent the last few months getting the lab ready for its summer deployment. She grew up on the shores of Lake Erie in Catawba Island, Ohio, and attended Bowling Green State University. “The local economies on the lakeshore depend on the vitality of the lake, so we all want Lake Erie to thrive,” Davenport said. “I’m really proud to be working in Great Lakes water quality research, because it benefits people’s lives in a way that’s tangible. In addition to her work with ESPniagara, Davenport is part of a CIGLR-NOAA harmful algal bloom monitoring team that makes weekly trips to Lake Erie to collect water samples for analysis back in Ann Arbor. Getting those test results typically takes 24 to 48 hours. But with ESPniagara, microcystin results are relayed to the researchers three to four hours after the device collects a water sample. The team’s weekly sampling trips to Lake Erie will continue and are part of a comprehensive harmful algal bloom research program that also includes analysis of satellite imagery, genetic studies of cyanobacteria and the issuing of regular HABs bulletins to the public. A significant portion of the team’s $2.5 million annual budget is provided by the Great Lakes Restoration Initiative. On July 13, NOAA issued its seasonal harmful algal bloom forecast for Lake Erie, which called for a “significant” HAB to develop in the western basin this summer. The main driver of Lake Erie’s harmful algal blooms is elevated phosphorus from watersheds draining to the lake’s western basin, particularly from the heavily agricultural Maumee River watershed. NOAA’s harmful algal bloom forecasts predict the size, or biomass, of a bloom but say nothing about its toxicity. Levels of microcystin toxins in the bloom vary throughout the summer as the composition of its cyanobacterial community changes. ESPniagara provides a first step toward providing Lake Erie HABs forecasts that include toxicity information, Johengen said. ESPniagara weighs more than 1,000 pounds and is lowered into the lake from the deck of a ship. It consists of a protective steel framework surrounding an analytical biochemistry lab inside a waterproof canister, along with a buoy that floats overhead. The steel framework is called the ESP lander, and it rests directly on the lake bottom. The buoy is tethered to the lab by a plastic hose and a data cable. 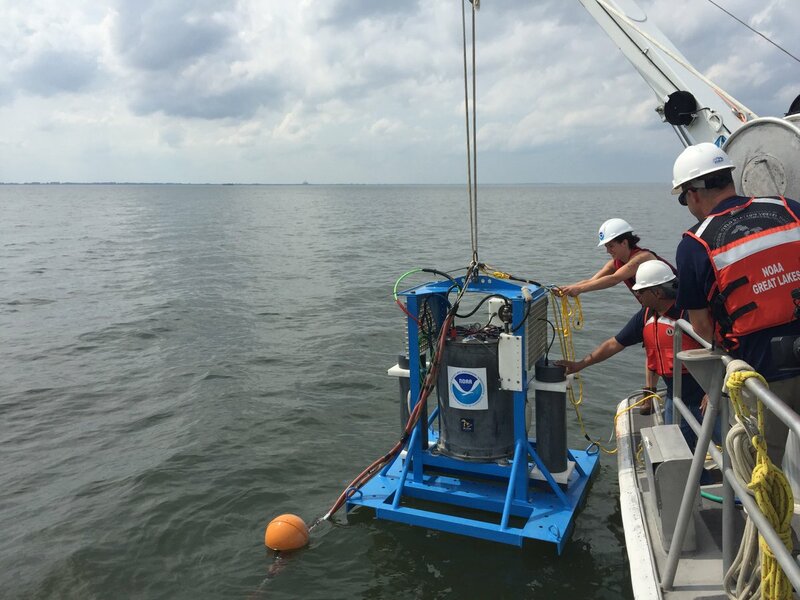 The buoy collects water from the surface and pumps it down the hose to the lab, and it is also fitted with a cellular modem to transmit results back to Ann Arbor. Water samples are also collected 4 feet above the lake bottom, the same depth used by many municipal water intakes. Inside the custom-built wet lab, cyanobacteria cells are filtered from the water samples, then the microcystin toxins are extracted from the cells. The liquid extract is then processed using an ELISA analytical biochemistry assay, a common biomedical test that uses antibodies and color change to identify substances. Once the test is complete, an onboard camera snaps a picture of the result and sends it back to Ann Arbor, where the brightness of the image is used to determine the amount of microcystin in the sample. “The Toledo water crisis pushed the issue of Lake Erie harmful algal blooms into the spotlight and showed how impactful they can be to people’s daily lives — and potentially to human health — by affecting one of the basic resources that we need for life, which is clean drinking water,” Davis said.